Admittedly, there’s a certain romance around him. He was trained as a physician and traveled the world as a revolutionary, fought in jungles and all that fun movie stuff. The thing is, he killed actual people and had a real ideology of oppression. Che’s socialist plan was about oppression at its core, as socialism always is. It was about forcing the personal will of a few powerful men on the rest of society. While the capitalism he hated so much is about the combined will of all citizens. Capitalism is an amazing computer which calculates the desires of every person with every choice they make. The free market is a reflection of the wants and needs of each participant. The best example is this: in a socialist “paradise”, a group of people cannot create a capitalist commune if they want to; yet, in a capitalist paradise, anyone can create any type of commune based on any type of system they want. Socialism can exist in a capitalist society, but not the other way around. In the end, capitalism is about freedom, and socialism… isn’t. So why do so many people wear Che’s image? Because human beings have an innate drive toward cultism. We need to belong to some group, while at the same time we need to rebel against tradition. And Che symbolizes a certain hard edged secular religion, and a vague rebellion against everything. His brand allows you to be a rebel and still fit in. His real ideology is meaningless at this point, and his face is simply a design element, like the Nike swoosh or the golden arches or the silhouette of Michael Jordan dunking. So you can’t fault the wealthy suburban teenagers for wearing it, it’s fashion, and they don’t know any better. In the US, we’re comfortable, away from all the pain and suffering of the third world, so we can fantasize about anything we want. We can rail against genetically modified crops, while in Africa they save millions of lives by allowing more nutritious food to be grown in less fertile land, with less space. We can complain about third world “sweatshops”, while in those countries, the workers have the choice of working either in those factories, or as subsistence farmers making less than half what the factory pays. We can talk about the horrors of capitalism, but capitalism has given us the freedom to be so wrong. Without the years of free market capitalism giving us the wealth we have, we wouldn’t have the free time to complain today or the social freedom to express our poorly thought out views in t-shirt form. 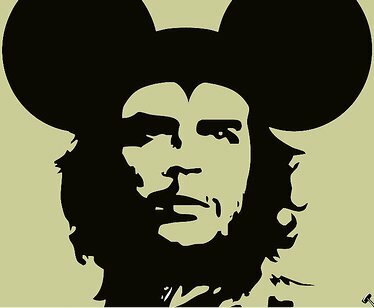 Ironically, the Che face of today symbolizes that more than anything else, the triumph of capitalism over socialism. He’s been fully assimilated by the free market, with t-shirt companies and Hollywood studios making money from his image and consumers using it as a fashion statement. Freedom has won, Viva la Revolucion.